I arrived at Mohawk Bend for “Ballast Point Spirits and Beer Extravaganza!” and was quickly seated. They Ballast Point beer menu listed several beers that I had never had before so it quickly became a numbers game of how much could I drink and still drive myself home at the end of the night. Since I had planned to order food when the rest of my party arrived I didn’t want to ruin my taste buds by going for the Habanero Sculpin so instead I settled on a beer brewed with cumin, curry, and coconut. Good call. 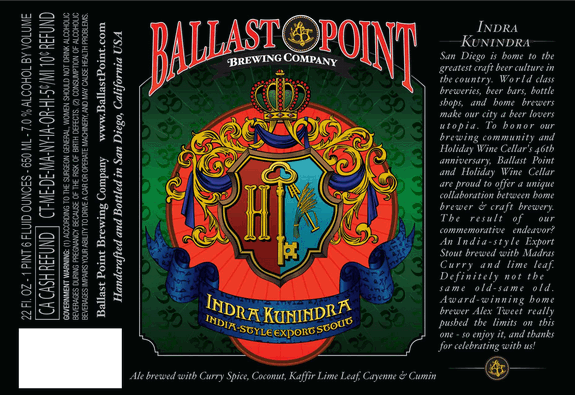 INDRA KUNINDRA is an India Style Export Stout brewed with a 7% ABV.